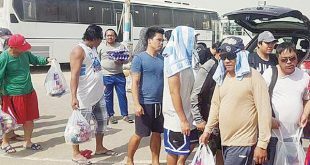 KUWAIT CITY, April 5: Sandigan Kuwait in cooperation with the Philippine Embassy held a two-day medical mission at the POLO-OWWA. 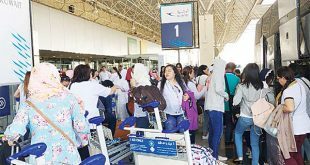 More than 30 organizations, 370 volunteers including nurses from various hospitals and clinics in Kuwait, 22 doctors including Kuwaiti physicians and other nationalities and more than a hundred donors heeded the call to serve more than 1,000 distressed overseas Filipino workers currently housed at the shelter. The huge charity event witnessed a gathering of Filipino groups and other nationalities with a sole purpose to help others in need. Total packs of 2,100 goods and medicines were collected and distributed. 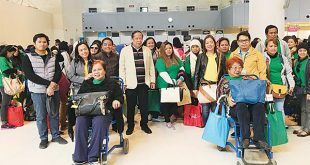 “I’ve been here in Kuwait for so long and I have never seen or felt this much generosity and unity,” says Mary Ann Abunda of Sandigan Kuwait. “We envisioned a simple medical mission but it has morphed into a magnanimous event of charity and volunteerism thanks to the outpour of love from everyone who participated. 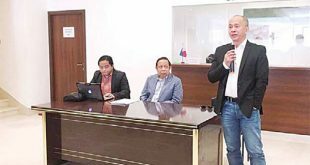 We would also wish to thank the Philippine Embassy officials headed by HE Renato Pedro O. Villa and POLO-OWWA officials for their support,” added Abunda. 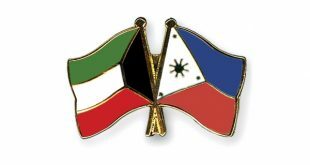 The Sandigan Kuwait wishes to thank the following for their tireless efforts and generosity: Dr Munazzah Doi, Dr Mohammed Ebrahim Alhashemi, Dr Abdullah Ali Alhudaib, Dr Ahmad Adel Alqattan, Dr Raed Mohammed Baraka, Dr Zainab Ibrahim Mohammed, Dr Abdullah Nabeel Alawadi, Dr Ali Mehdi Zadeh, Dr Artemio Usana Jr, Dr Sarah Khoury, Dr Amir Ahmed Kanjarandy, Dr Imen Belarif, Dr Khadjie Nadar, Dr Hussam Al Quossus, Dr Christian Waraji, Dr Emilia Zapanta, Dr Liza De Los Santos, Dr Aileen Basuil, Dr Sandra Salazar, Dr Emerlita Grantos, Dr Paolo Gaylord Villafane and Dr Cristina Cura. According to Sandigan, the event wouldn’t be a success without these selfless organizations and institutions and their drive to help others: Sandigan Kuwait Domestic Workers Association, PNA-K-Pinoy Nurses Association, Kuwait- Central Prison Nurses or the JAIL BOYS Kuwait, PANIK — Pinoy Ambulance Nurses in Kuwait, Phil- SOC — Philippine Society of Marketing Specialist in Kuwait, Infinity Event Management and Talents. 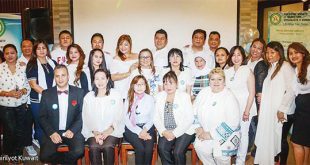 Infinity Medical Company, TISOK — Triskelion International State of Kuwait, Coalition of Guardians Fraternal Brotherhood International Incorporated, SanaysahirapofwKuwait, Filipino Oral Hygienists Society of Kuwait, Pinoy Group Association Kuwait OFW, Surigaunon International State of Kuwait, BayanihanTayo Pilipino sa Kuwait, KOFG, SFC, OFW Aguila Movement, KFMO, AKRHO, KFM Boys, Alorf Hospital, Kuwait Medical International, Al Maidan Clinic, Dar Al Shifa Hospital, Dental 8 Clinic, Malaksns, Kuwait Medical International, Kuwait Hospital, Al Jarallah German Specialized Clinic, Al Seef Hospital, Ibn Sina Hospital, Ahmadi Hospital, Amiri Hospital, Bayan Dental Center, KOC, Air Ambulance Kuwait, Duterte Connection Restaurant, Al Alamia International, A.D.M INTERNATIONAL, IAM WORLDWIDE, SKY FREIGHT, CARINIOSA TRAVELS and Transoverseas Agency. Sandigan wishes to send special thanks to Dr Essa, Kuwait Saudi Pharmaceutical Industries Company — for the medicines, Chairman Taleb Hussain Ali Jraq of Dar Al Shifa Hospital for donating 997 packs of goods and also for allowing Filipino nurses to join our Medical Mission, Dr Sandra Salazar for donating 243 slippers, Virginia de Leon Lelix and Architect Arthur Lelix Jr, Dennis Romeo Malay, Ana del Mundo and Kuya Ronnie Ramos, Mildred Lacson, Nelson Lacson, Najwa Lacson, Alejandro Ben B. Braga IV and John Braga, Chris Caburian, Dolores Elenany, Enilej Iml, Mariam Pondimirra Macapudi, Norma Duquette, Philippine Embassy in Kuwait, POLO-OWWA Kuwait, Philippines Department of Foreign Affairs and the Kuwait Ministry of Health.